As I'll admit I'm less than enthusiastic over the Angie's List Grand Prix on Indianapolis Motor Speedway's road course, especially since I bristle most over the usage of the term Grand Prix, which after all is what European Formula 1 races are! Not to mention that before there was an actual Grand Prix in America, there was the American Grand Prize between 1908-16 instead. As what I find funniest about the American Grand Prize was the inaugural host city's use of Prison Convicts to build the racecourse! Which somehow I doubt would happen today? Whilst I also highly doubt they got to have Turkey Dinner at the race-track - for which the inaugural race was held on! The race wasn't held in 1909 and 1913 - with the first time being due to Long Island deciding not to hold it in conjunction with that year's Vanderbilt Cup race, and later Long Island's request was not accepted while Savanna turned it down due to the event's unpopular standing with residents. 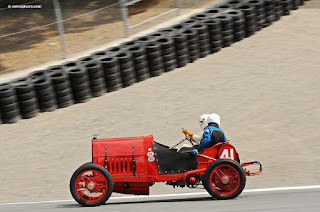 Interestingly, on a tangent regarding my Home state of Washington, the 1914 winner, Eddie Pullen, whom I've never heard of before - reportedly was also victorious at Tacoma Speedway's road course where he claimed his first ever National Champ Car race in the early 1910's, prior to the track being turned into a Boardtrack Oval, which were all the rage culminating in the early 1920's. 500, Vanderbilt Cup and the Grand Prize, for which he won two out-of-three both years 1915-16! Other Indy 500 winners such as Ralph de Palma contested the Grand Prize, yet due to mechanical failure, whilst De Palma also won the Vanderbilt Cup twice, the Grand Prize trophy eluded him. Meanwhile, the most winningest driver All-time at the Brickyard, Johnny Aitken, who also holds the record for most starts at Indianapolis has the dubious distinction of being classified first and last place in the final Grand Prize race - having substituted for Howdy Wilcox after his car "Done Blown Up" on Lap-1! The race followed upon the heels of the Gordon Benet and Vanderbilt Cup races, with the latter running in conjunction with the American Grand Prize during its final years (1911-16) before something known as the First Great War, aka World War One got in the way. Ironically, the American Grand Prize's trophy, for which I cannot find any pertinent information upon was shortly resurrected between 1930-35 as the forbearer to some trophy fondly known as the Borg Warner "Mug" which debuted at Mother Speedway in 1936! Perhaps I'll actually try tunin' into Thy race for once, if I can manage to get the ever elusive & constantly moving plus totally NON Screen-reader friendly Indycar.com website to cooperate? Since after all I think Eddie Cheever will still be busy layin' Bricks' Err building thy Foundation for the Indy 500 on ABC? Hmm? May be somebody could give Eddie a bag 'O Rachels potato chips to munch on during the broadcast; Oh Never Mind! Alas, I'll confess that my IMS Oval's only stance is pretty funny since I'm a Twisty' devotee, yet I'll also admit that I like the idea that the Indianapolis Grand Prix affords certain drivers a chance to double their amount 'O seat-time at Mother Speedway - with such driver's as Alex Tagliani, J.R. Hildebrand, Spencer Pigot and Mathew Brabham getting to run "The Double" at Thy Brickyard in May, as this novel marketing sweepstakes continues growing, and it actually gives local fans some more racing. Since obviously it's a good thing to utilize the infield road course, which is now in its third iteration, having been originally built for the United States Grand Prix, when Formula 1 invaded Mother Speedway between 2000-07. Then the course was slightly modified to host thee Crème de la Crème 'O Scooters', those ultra insane Knee-draggers, aka MotoGP from 2008-2015, along with the Rolex Grand Am and Tudor United Sports Cars series using the left & right turns road course circuit for the Brickyard Grand Prix between 2012-14.
then there was a major makeover to the circuit as initially Thy Knee-dragger's had complained about its bumpiness, for which the road course was re-profiled for MotoGP and GASP! Indy Cars, with track construction work beginning in October, 2013 after an IndyCar feasibility test had occurred earlier that year, which ultimately led to the inaugural Angie's List Grand Prix of Indianapolis being held in 2014. As this first event saw Thy Mayor 'O Hinchtown getting knocked unconscious during an abortive Standing Start, which also saw Indianapolis Mayor Greg Ballard being struck by debris! Hinchcliffe was struck by debris mid-race in 2014, not during the wreck on the standing start.